The presidential election was bad news for progressives, but the dark cloud had a sort of silver lining—ballot measures. At the state level, workers won minimum wage increases in four states and paid sick leave in two. Voters approved an increase to $12 an hour by 2020 in Arizona, Colorado and Maine. Washington voted to raise the minimum wage to $13.50 by 2020—and index it to inflation after that. In Flagstaff, Arizona, voters approved an increase above the new state minimum wage, raising it to $15 an hour by 2021. These increases will affect about 2.3 million workers, according to the National Employment Law Project (NELP). And overall, the “minimum wage ballot wins bring to 19.3 million the number of workers who have received raises because of minimum wage increases in the four years since the Fight for $15 launched in New York City and began changing the politics of the country around wages,” noted NELP’s executive director, Christine Owens. 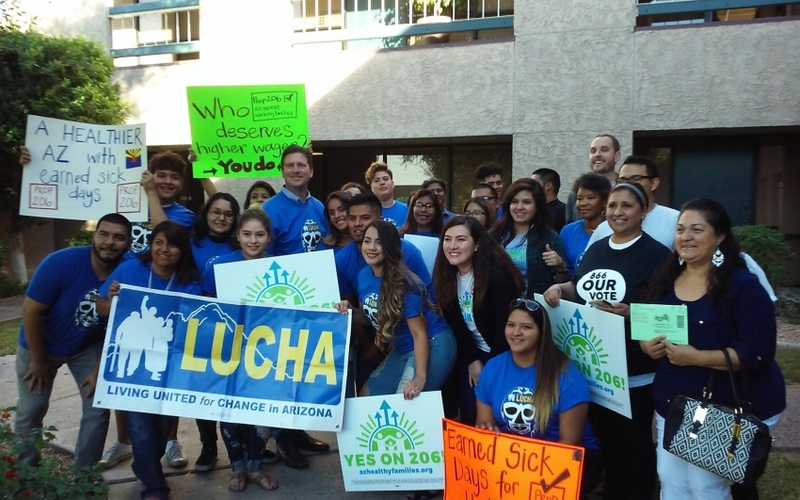 The measures in Arizona and Washington also included mandatory paid sick leave for workers. In Arizona, the initiative guaranteed at least 40 hours of paid leave for workers in businesses with 15 or more employees. Workers in businesses with fewer than 15 employees are guaranteed at least 24 hours. The law goes into effect July 2017. In Washington, workers will earn a minimum of one hour of paid sick leave for every 40 hours worked. That law takes effect in 2018. In South Dakota, meanwhile, voters rejected a decrease in the minimum wage for non-tipped workers under the age of 18. And voters in Maine and Flagstaff abolished the sub-minimum wage for tipped workers, guaranteeing them the regular minimum wage. The state and local minimum wage increases promise substantial benefits for a wide range of workers. Maine’s measure, for example, will raise wages for about 180,000 people, according to NELP. About a third of them are working seniors, who are “among the fastest-growing age groups in Maine’s labor force”—a trend that applies nationwide. A report by the Women’s Foundation of Colorado found that the state’s $12 minimum wage will affect about 200,000 households with children and 290,000 women. The increase for most female minimum wage workers will be between $4,000 and $7,000 a year. The study also found that the median age of minimum wage workers is 30 and that more than 35 percent of them are over 40. In other states, Alabama and Virginia voted on whether to enshrine so-called right-to-work laws into their state constitutions. In “right-to-work” states, employees can opt out of paying union dues. Both states already have such laws on the books, but putting them in the constitution would make them permanent. Alabama approved the measure. Virginia rejected it. In the realm of health care, Colorado rejected an initiative that would have created a universal health care system in the state, with 80 percent voting against. Also in Colorado, voters rejected (51-49 percent) a measure designed to alter the state’s constitution by deleting language from 1876 that allows slavery among people who are being punished for a crime. The proposed amendment highlighted growing concerns over working conditions in prisons and would have prohibited slavery in all cases. The state chapter of the AFL-CIO had supported the change. Even though workers didn’t win on every initiative, the success of the minimum wage and paid sick leave measures suggests one promising path forward for progressives. Of the more than 160 total ballot measures this year, 71 were initiated through signature petitions rather than state legislatures. This blog originally appeared at inthesetimes.com on November 10, 2016. Reprinted with permission. Theo Anderson, an In These Times staff writer, is writing a book about the historical and contemporary influence of pragmatism on American politics. He has a Ph.D. in American history from Yale University and teaches history and literature seminars at the Newberry Library in Chicago. This entry was posted on Wednesday, November 16th, 2016 at 3:58 pm. You can follow any responses to this entry through the RSS 2.0 feed. You can leave a response, or trackback from your own site.